Collation :  f. (sig. A-M8 N4) Ill.
Titre long: Imagines mortis. 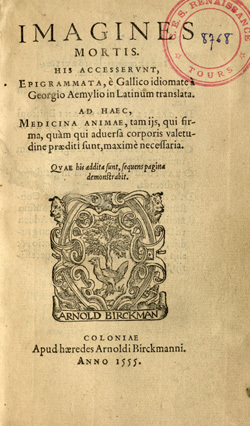 His accesserunt, Epigrammata, è Gallico idiomate à Georgio Aemylio in Latinum translata. Ad haec, Medicina animae, tam ijs, qui firma, quàm qui aduersa corporis valetudine praediti sunt, maximè necessaria. Quae his addita sunt, sequens pagina demonstrabit. Notes : Cette édition reprend dans le cadre d'un Ars moriendi composite les gravures des éditions lyonnaises données par les frères Trechsel. Etat physique : Manque le dernier feuillet blanc. Reliure : Reliure veau (XVIIe siècle ?). Bibliographie : Verzeichnis der im Deutschen Sprachbereich Erschienenen Drucke des XVI. Jahrhunderts - VD 16, Band 4, Stuttgart, 1985, C 5282. Davies (H. WM. ), Catalogue of a collection of early German Books in the library of C. Fairfax Murray, London, 1962, n° 203. Adams (H. M.), Catalogue of Books printed on the Continent of Europe, 1501-1600 in Cambridge libraries, Cambridge, 1967, D-75. Bätschmann (O.) et Griener (P.), Hans Holbein, Paris, 1997, p. 53-63. Davis (N. Z. ), "Holbein's Pictures of Death and the Reformation at Lyons", Studies in the Renaissance, III (1956), p. 97-130. Michael (E.), "The Iconographic History of Hans Holbein the Younger's Icones and their Reception in the Later Sixteenth Century", Harvard Library Bulletin, III (1992), p. 28-47.